Central Educational Center (CEC) is a publicly-funded charter college and career academy in Newnan, Coweta County, Georgia. CEC is a joint-venture partnership among the Coweta County School System, West Georgia Technical College, and business and industry, providing learners from 8th-12th grade, and throughout adulthood, a seamless education for life. "Team members” (8th-12th grade students) attending Central Educational Center attend voluntarily from one of six middle schools or from one of three high schools in Coweta County, and may still participate in regular middle school and high school activities. These team members graduate from the high school in which they are enrolled, just like other students. Courses they take at CEC seamlessly combine traditional and applied academics with career and technical education, providing opportunities for work-based and project-based learning, teamwork, and a high set of expectations for personal and professional achievement. 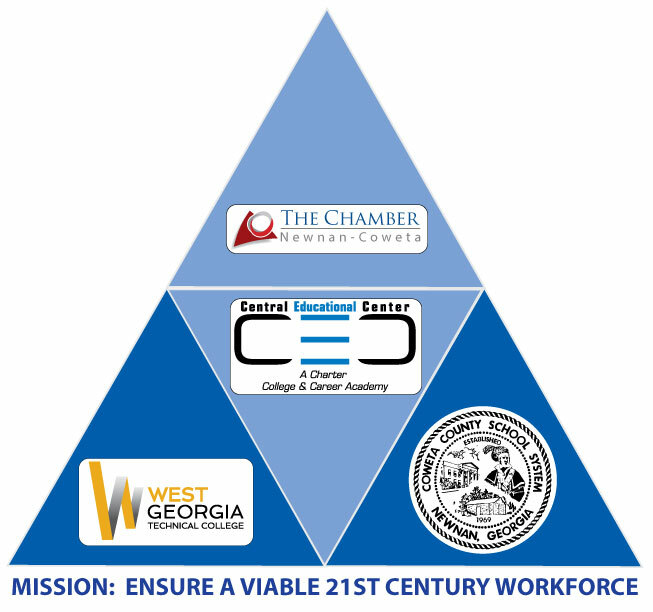 CEC team members may also take dual-enrolled college classes with West Georgia Technical College, earning simultaneous credit in high school and college. Work ethic is a key component in grading team member performance. In college classes, there are separate grades for academic performance and for work ethic performance. In high school classes, a component of every academic grade is work ethic performance. The impact on that academic grade is made larger since points are added for exceptional attendance, or points are deducted for poor attendance, based on objective standards for work ethic. More than 200 organizations provide internship opportunities for more than 400 CEC team members annually, and those organizations grade interns on work ethic performance at least twice per semester. High school team members take classes with adult learners, and adults also enroll at CEC for GED, day and evening technical college courses, and customized training for local corporations. CEC has been visited by more than 500 organizations from most US states and 16 countries, has been studied in Japanese educational literature, serves Georgia as the model for the state's charter College and Career Academy Initiative, and has been named a national model for high school educational reform. For more than 40 years, Quick Start has provided customized workforce training free-of-charge to qualified businesses in Georgia. Today, the program is one of the state's key assets for supporting new and expanding industries. Quick Start delivers training in classrooms, mobile labs or directly on the plant floor, wherever it works best for a company. To ensure that all economic development personnel are prepared with the latest skills strategies for workforce training, Quick Start also administers an ongoing program for professional development, the Certified Economic Developer Trainer program. Quick Start's five regional offices mean that no matter where in Georgia a company chooses to locate, a Quick Start team of experts is available to provide local support for any project. Training coordinators familiar with their areas and the local workforce are uniquely positioned to provide timely, customized training. Each office is also staffed with a team of graphic designers, illustrators and desktop publishers, to produce training materials, tailored to your needs, quickly and efficiently. Helping individuals attain their work goals and increase self-sufficiency through employment, training, comprehensive rehabilitation, and support services. Helping employers meet their business needs through employee recruitment and selection services, workforce information, and technical support. With a staff of over 4,000 under the leadership of State Labor Commissioner Mark Butler, the GDOL consists of the following divisions and offices: Employment Services, Unemployment Insurance, Workforce Development, Rehabilitation Services, Safety Engineering, and Workforce Information and Analysis. Also, the Georgia Department of Labor has 53 local Career Centers and 53 Vocational Program offices throughout the state. For a complete list of services, please visit our web site at www.dol.state.ga.us.